Lost your keys or glasses? Blame your brain, writes Levitin (Psychology and Music/McGill Univ. ; The World in Six Songs: How the Musical Brain Created Human Nature, 2008, etc.) in this ingenious combination of neuroscience and self-help. Levitin, who served as a studio musician and sound engineer before becoming a neuroscientist, stresses that evolution does not design things but, over millions of years, settles on systems that get the job done. The brain worked well enough for our Stone Age ancestors and has barely changed since then, during which it has been forced to absorb vastly more knowledge than ever before in human history. Critics of every expansion of information access (writing, printing press, TV, Internet, social media) warn that the information expansion has gone too far and will make us stupid. 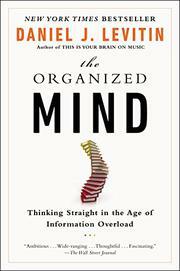 While disagreeing, Levitin admits that brains evolved to focus on one thing at a time and filter out distractions, but this “attentional system” is outdated when confronted with today’s avalanche of input. Memory is also unreliable; worse, we often refuse to believe it. Most Americans, President George W. Bush included, remember watching TV on 9/11 and seeing two planes striking the World Trade Center towers 20 minutes apart. This is a false memory, however; videos of the first plane didn’t appear until the following day. Levitin fills a third of his book with insights derived from neuroscience. In the remainder, he delivers advice for organizing your life by shifting the burden from neurons to the outside world. He provides imaginative suggestions involving filing systems, labels and multiple computers, as well as tactics to determine the usefulness (i.e., truth) of the excess of information in today’s media. A prolific genre of books covers this subject, but Levitin holds his own, and his examination of brain function stands out.